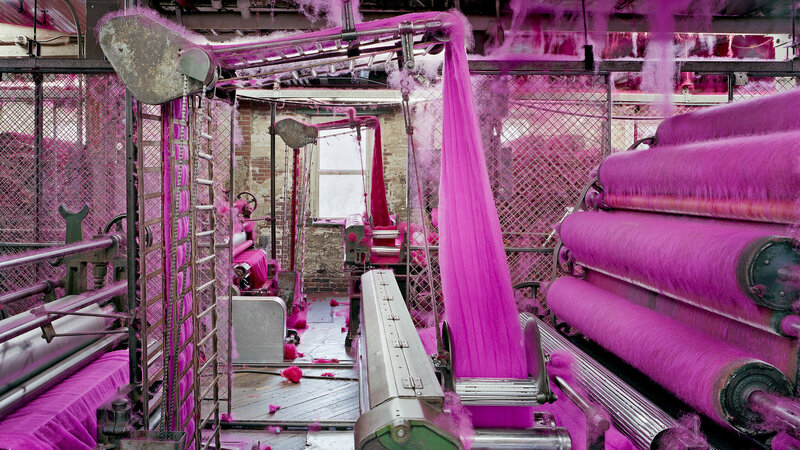 Christopher Payne has spent much of the past few years photographing more than 20 of the mills that make up what’s left of America’s textile industry. Read the article and embrace the photographs from the NY Times. I just read this article and am old enough to feel as though I am in mourning over the losses. http://www.nytimes.com/2014/01/12/magazine/fruits-of-the-loom.html I find his photographs hauntingly beautiful juxtapositions. I am reminded that textile production is toxic , but the results can be gorgeous. So much has changed since my entry into the textile industry in the mid 1980’s. MY first big girl job with Carter’s (baby clothing) and Baby Dior. We were headquartered just outside of Boston. The company was vertically integrated. Carter’s had its own spinning mills, weaving and knitting mills, printing and dye mills, apparel manufacturing facilities and even its own stores. My primary job was to buy greige goods, convert them to dyed and printed fabrics and to oversee the approval of colors and prints (strike-offs) at the mills. I trudged through rural towns after renting cars at the airport to get to mills in the Carolinas, Mississippi and Georgia. Burlington and Milliken were HUGE . It was no big deal for me to approving a 100,000 yard roller screen print run and wait 12 hours in the Customer Room for the next strike-off. So much has changed.